This is a very large hand-and-a-half war sword of type XIIIA. It has a large, flat oval pommel, the edges bevelled off, plus a very long, stout tang of flat rectangular. The cross of faintly hexagonal section is very slightly arched and widening imperceptibly to the tips. The sword features a very broad, heavy blade of flat section with very well-marked chamfered edges with a broad shallow fuller running halfway down. 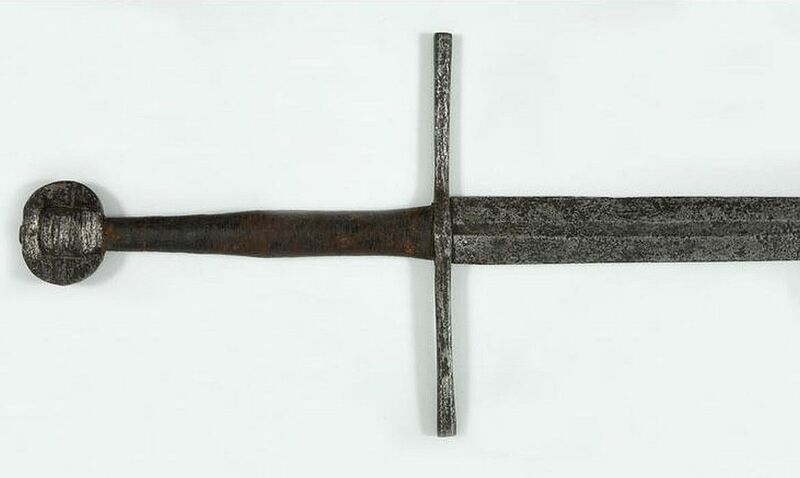 The length of the tang of this sword is such that it is more in the nature of a small two handed sword. The length of the tang of this sword is such that it is more in the nature of a small two handed sword. A hilt similar in all respects is shown on the tomb-effigy of Guther von Schwarzburg in the Cathedral at Frankfurt (1349).